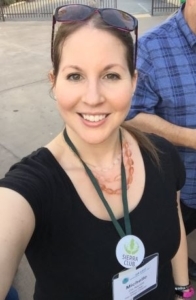 After taking the Wilderness Basics Course, Stefanie Maio became a member of the Sierra Club San Diego in 2007. Since then she has become active in the Chapter by leading outings on the Bus Trips, being Chairperson of the 2016/17 Wilderness Basics Course and is now the Outings Leadership Training Coordinator for San Diego. She is passionate about the outdoors and enjoys inspiring others to explore, enjoy and protect the planet! Beat the Heat! Be Safe when Hiking this Summer in San Diego! As summer approaches, the days become longer, the weather warms up and many of us want to get outdoors and explore the trails to local watering holes and waterfalls. Two of the most popular hikes in the area are Cedar Creek Falls and the Three Sisters Falls. What many people don’t realize is that these trails can get extremely hot and have little shade. In addition, they are canyon hikes…meaning the hike starts with a descent and to finish the hike you must go uphill. On a weekend in July 2017, 8 people were rescued from the Three Sisters Falls trail due to heat related issues and recently a young woman died due to dehydration and being overheated. Even for the most fit, these hikes can be extremely challenging on a hot day. Many of the trails in San Diego county get can extremely hot during the summer months, with proper planning and avoiding the hot days, you can experience many of the hikes the county and the surrounding area has to offer. 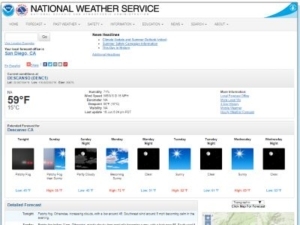 Weather in San Diego county can vary drastically from the coast, to the mountains, to the desert and therefore, it’s a good idea to check the weather report prior to heading out for your hike any time of the year. If you have a hike in mind and the weather report calls for a hot day…save that hike for another day and choose a destination that is cooler or consider a different activity. San Diego and the surrounding area provides a variety of hiking options. On hot days, choose to hike in locations that provide shade or are along the coast or at higher elevations where are temperatures are often cooler. Hikes along streams, rivers and lakes are a bonus! Not only can you cool off in the water, you can carry less drinking water providing that you have a water filter or bring chemicals to treat the water. Be sure to check on the water levels for safe entry and to ensure that there is water to filter as many natural water sources tend to dry up in the summer months in Southern California. Go hiking early in the morning, late afternoon or in the evening when the sun is not at its hottest temperatures. Avoid hiking between 10:00 AM and 3:00 PM. Drink a liter or quart of water prior to starting your hike so that you are hydrated. Keep hydrated by drinking small amounts of water frequently. Remind others that you are hiking with to keep drinking. It’s easiest to drink water from a bladder reservoir while hiking. Bring along a 500ml bottle of water, so if you run out of water in your reservoir, you’ll have a backup and you’ll know that it’s time to look for a stream to filter water or head back to the trail head. In addition, it’s a good idea to keep extra drinking water in your car. When it’s hot, freeze a bottle of water, so it melts along the way and you can have a cold drink! On a regular day, the body needs roughly four liters or a gallon of fluids. In hot weather or with heavy exertion, your body will need more. For a hike to the Three Sisters Waterfalls, a minimum of a gallon of water per person is recommended. Warning signs: if you have a dry mouth, or “cotton mouth” or you are thirsty, if you don’t feel the need to urinate or your urine is dark/bright yellow (not due to the vitamins you just took), you might be at risk for dehydration and your body make not be working at its optimal level. As you sweat, your body loses electrolytes such as potassium, sodium, magnesium, phosphorus and calcium which may cause fatigue, muscle weakness, muscle cramps, confusion and nausea. You normally replenish your electrolytes with a balanced diet. When it’s hot and you are exerting yourself, your body loses electrolytes at a greater rate. Electrolytes can be replenished with sport drinks and powder mixes, electrolyte gels and chews. On hot day hikes, you can freeze coconut water drink boxes and then enjoy a slushy drink packed with electrolytes at the peak. This also makes a great ice pack to keep other foods chilled until lunch or an ice pack for a minor injury. Many of the hikes in San Diego tend to be void of shade when you need it the most. Create your own shade by carrying an umbrella. 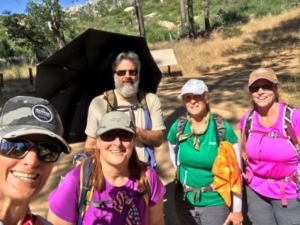 Several instructors with the San Diego Wilderness Basics Course carry the Liteflex Hiking Umbrella from Gossamer Gear for its durability, lightweight, extended canopy and UV protection fabric. Choose clothing that is lightweight, loose fitting and breathable to help regulate your body’s temperature. Avoid dark clothing as it tends to attract the sun’s rays and make you hotter. Go for a lighter color palette…plus dirt doesn’t show up as much on sand color and grey clothing. The Wilderness Basics Course has a saying “Cotton Kills”, however, in the hot summer months, cotton clothing is acceptable as the sweat trapped in the fabric can provide a cooling effect. Also, you can soak a cotton top in a stream or in a wide-mouthed Nalgene bottle with water to cool you off! From baseball style hats, trucker hats, wide brim hats to gardening hats…pick one that you like and wear it! Hats with broader brims tend to be better in shielding your eyes, face, neck and ears from the sun. Even with a hat, it’s important to protect your eyes by wearing sunglasses and sunscreen to prevent your skin from burning. Remember to apply sunscreen to the back your ears…as it’s a spot that can easily burn and most people forget this area until it’s too late! Before going on any outing, it’s always a good idea to assess the physical demands of the hike for you and your entire group. A hike that seems effortless on a cool day could easily deplete your energy on a hot day. If you or anyone in your group, is having a hard time with the hike, it’s better to turn around and do the hike another day, than to never hike again. Learn about the signs and symptoms of heat cramps, heat exhaustion, heat stroke and what first aid measures to take in this article by the American Red Cross. Recognizing the signs and symptoms early and knowing what to do, can make the difference between life and death. 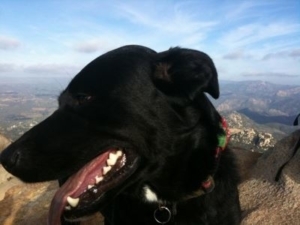 We all love to take our dogs with us when we go for a hike as what dog doesn’t love the opportunity to get outdoors? However, when the temperatures heat up, it’s best to leave your four-legged friend at home where it’s not hot. Dogs can easily get heat exhaustion as they don’t have the same mechanisms as we do to shed heat. If an emergency does occur and you find yourself having to spend unexpected time in the outdoors or even the night, the 10 Essentials can make the difference. There are more than 10 essentials, but all experts agree on carrying the following: navigation (map and compass), sun protection (sunglasses, sunscreen, hat), insulation (clothing), illumination (headlamp, flashlight), first aid kit, fire starter (matches, lighter), repair kit (knife, tools), nutrition (extra food), hydration (extra water), and emergency shelter (rain gear, poncho, space blanket). It’s a great idea to have an emergency contact if you don’t return from your hike. 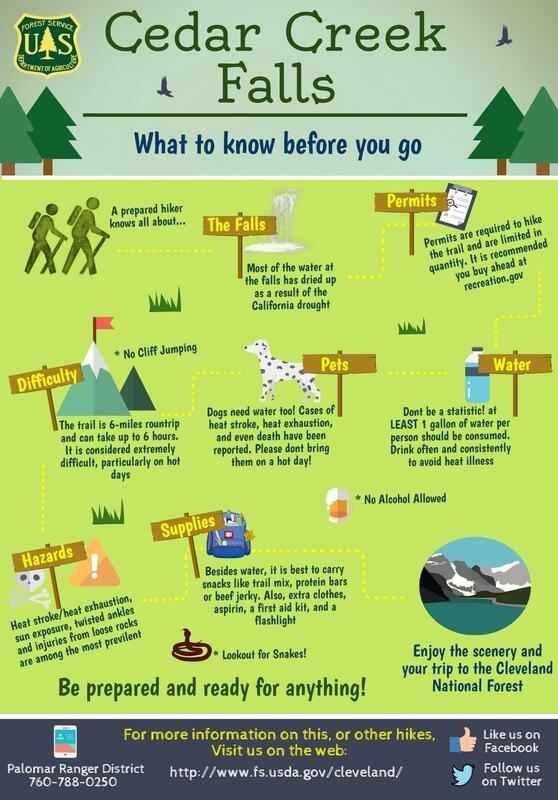 Tell a reliable family member or friend your hiking plan. Provide them with the following information: who you are hiking with, the location of the trail head, the route you’ll be taking, when you plan to return and what to do if you don’t return. Remember to check in with your emergency contact when you get back to the car and have cell service, as you would hate for your emergency contact to send out a search & rescue team and you’re at a restaurant celebrating the day! 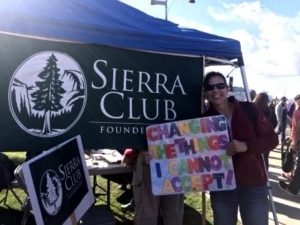 The Sierra Club mission is to explore, enjoy and protect the planet. The San Diego Chapter offers free hikes to the public with leaders trained in hiking and first aid. 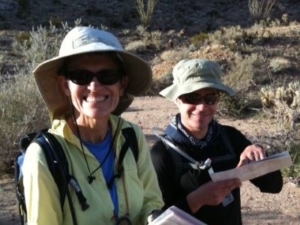 In addition, the award winning Wilderness Basics Course is offered in North County and San Diego each year from January to April. The course teaches the fundamentals of hiking, backpacking and camping safety in a 10-week course featuring lectures and 4 weekend practical outdoor outings. 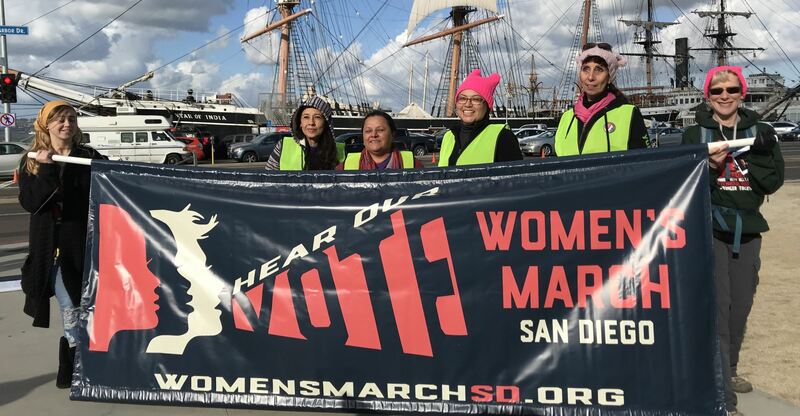 I asked a few members of the Sierra Club San Diego to tell me about their experience at the 2018 Women’s March. 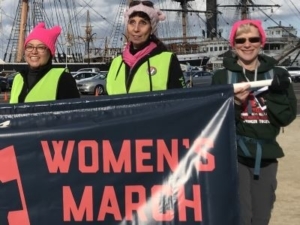 Approximately 1.6 million people participated in the March across the United States to celebrate women and to march for a number of issues that affect everyone nationwide! Over 37,000 participants attended the event in San Diego and roughly 4000 in North County at Palomar College. We would love to hear about your experience and what the march means for you. We welcome your comments below. 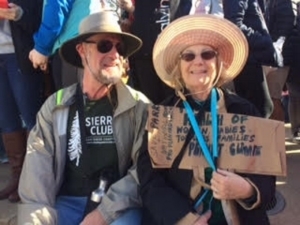 Arriving at 7 am at the County Administrative Center on the morning of the Women’s March to set up the Sierra Club booth, my husband, Jay, and I worried that maybe not many people would attend the March this year. I feared that the publicity had not been as great nor as well orchestrated as last year. But as the morning progressed, slowly the crowd began to grow and then swell to fill the event area and then suddenly there was just a sea of people with signs galore. Most all of the signs were hand made with very personal, inspiring, creative and provocative messages. This definitely is a grass roots movement…you could just feel the energy in the crowd. 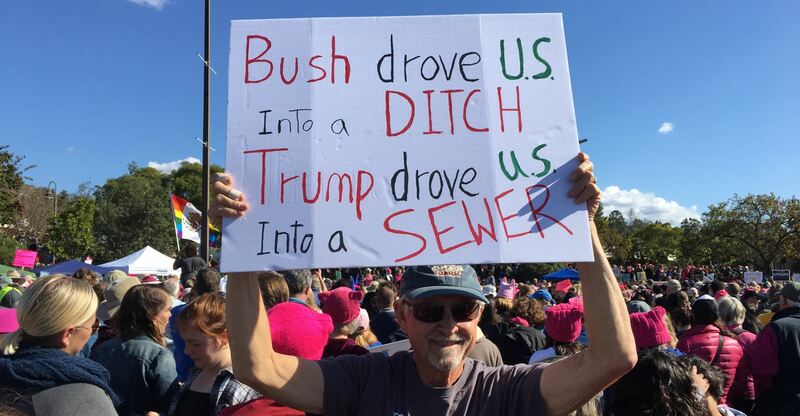 One of the best signs was “Grab Them by the Midterms”. As always the goal is to somehow transform that energy into continued activism. At the Sierra Club Booth over 100 people signed post cards to send to Ryan Zinke, Secretary of the Interior, protesting the planned reduction of National Parks and the opening those areas to mining and drilling. 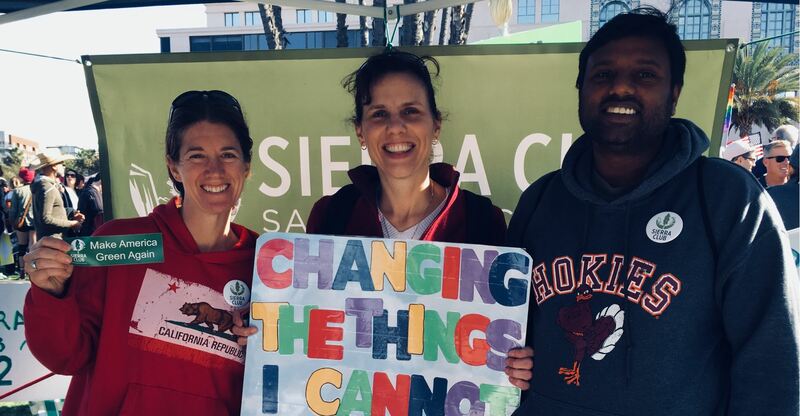 People also signed up wanting to volunteer with the Sierra Club expressing the need to “Do Something” to insure our environment is protected and that our planet survives the growing climate change crisis. In short the March exceeded all expectations! It provided needed encouragement and support…We are Not Alone! This past Saturday was my first experience doing a march and I was very glad to have participated. 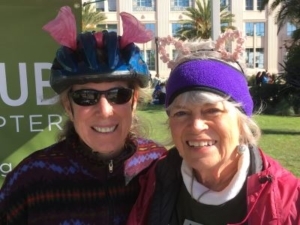 Two friends and I carpooled then walked to the Waterfront Park, where the areas was buzzing with activity – representatives from groups manned booths and met with participants, sharing their vision, looking for petition signatures, or just drumming up excitement for their cause. People running for office were shaking hands and educating constituents. Reading signs alone could entertain you for hours – from profound, deep famous quotes to hilarious satirical drawings. After about one and a half hours of speeches from a variety of women and organizations, the actual March began. We held our signs up high and proud, chanted along with megaphoned leaders, and enjoyed drumming and other music from the sidelines. It was a crisp gorgeous puffy-cloud day and I was very honored and humbled to be living in a country where this type of freedom of expression is welcomed and celebrated. For me, the Women’s March is about more than who sits in the White House. It is about environmental justice, reproductive justice, social justice and many other “justices” that are denied or abrogated under right wing regimes for women, people of color, immigrants, and worst of all – children. The individuals who scream the loudest about individual responsibility are among the first to deny individual rights. They want to classify families by color and gender rather than by love. They want to categorize children as either deserving (in utero) or undeserving (life long access to clean air and water, health care and education). They want to denigrate immigrants as rapists and murderers rather than welcome hard working people seeking what our immigrant ancestors sought – freedom and opportunity. I find the women and men who participate in the March and other similar activist activities to generally be seekers of truth and compromise, believers in education and strong work ethics, supporters of law enforcement and military personnel, protectors of love and families, and caretakers of our Mother Earth. Celebrating accomplishments and setting goals with 37,000 other energetic and joyful people on January 20, 2018 gave me hope and commitment that I will carry into the November elections. There were many signs that expressed frustration with current government policies and commitment to help our planet earth, prevent climate change, support science and to change our government in the primaries and midterm elections this year. Our movement needs a song the way “We shall overcome was the song of the sixties.” Maybe it’s the refrain by Muse I feel hopeful, as one sign said, “THERE IS A NEW DAY ON THE HORIZON”. 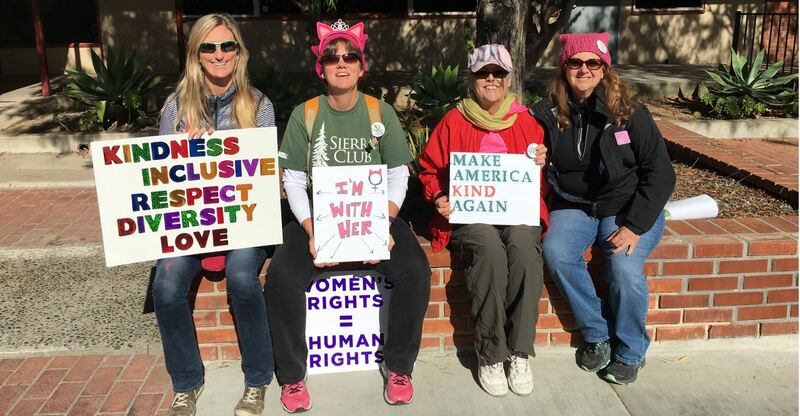 Being part of the Women’s March in North County was amazing! It was great to see so many people of all ages and ethnic backgrounds coming together to have their voices heard. 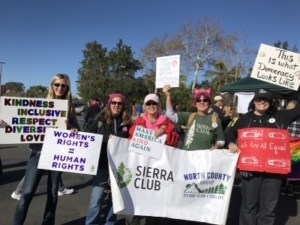 We had a number of new and existing Sierra Club members join us at Palomar College for the March. In addition to promoting women’s rights, people were sharing their views on the current administration. We saw messaging on signs that were humorous in nature, some were angry and some were motivational. One of my favorite initiatives is “Turning Congress Blue”. People were promoting the “Blue Wave” wearing blue gloves and blue ribbons to spread the word! We look forward to having an even larger contingency for next year’s March. Is Being Green on Your New Year’s List of Resolutions? You may remember Kermit the Frog singing the tune “it’s not easy being green”. Here are some tips from Michelle De Nicola on what you can do to live a greener lifestyle. Choose a couple of items and include them in your New Year’s List of Resolutions. + Towel Power – Use cloth towels instead of paper towels. Dedicate a few kitchen towels to drying produce after you wash it, and put a washcloth in with your baby greens to absorb moisture. Use a bar mob or sponge to clean up counter spills, and keep one for floor messes too. + BYO Towel – Keep a washcloth or small towel in your bag or car and at work, so when you are on the go, you can dry your hands with your own personal towel, instead of creating paper towel waste or using electricity from running electric hand dryer. + BYO Bags – Get reusable bags for all your shopping. Also try the mesh produce bags. Don’t buy into the so-called reusable plastic shopping bags or the paper bags at checkout. If you forgot your bags, grab a cart and wheel your groceries to your car. + Reusable Food Storage Bags – These will save you money and cut down on resources used to make virgin single-use plastic bags. + Bye, Bottled Water – It takes more water to make the plastic bottle of bottled water than to fill it up. Get a reusable, washable bottle instead. + Rechargeable batteries – Buy a few sets of rechargeable batteries with chargers instead of buying single-use. + Paper & Paper Products – Switch you office paper and paper products to a tree-free alternative, such as paper made from sugar cane or 100% post-consumer product. Not just printer paper, but also toilet paper, tissues, napkins, and paper towels. + Public Paper – Opt out of using paper towel in public restrooms. + Bills – Sign up for e-statements so your bills get delivered to your email inbox, not your mailbox. Less mail sorting, too! + Ditch the Receipts – Many retailers can now email and text receipts to you at the point of sale. Choose whenever you can. Plus, you’ll have more room in your wallet for other things, like cash! + Say No to To-Go boxes – Bring your own sandwich box when you eat out. If you’re picking up an order, bring your own bag. + Water Filtration – Buy a water filter pitcher or a filter for you kitchen sink. It’ll give you more filtered water for less money than bottled water. + Bioplastic Bags – Replace your plastic trash bags and doggie doo bags with bioplastic. It’s made from plants and is biodegradeable, unlike its petroleum counterpart. + Straws – When you dine out, tell your waiter or bartender you don’t want a straw. If you must have a straw, choose reusable (& get a cleaning kit), bioplastic, or recycled paper. + Avoid Polystyrene – Polystyrene is often called Styrofoam, but they’re not the same thing. Polystyrene (PS) is what the foamy white cups and to-go containers are made from. It’s toxic to make and leaches toxins into your food, especially when hot. + Bamboo, Baby! – Ditch the hardwood and choose bamboo for just about everything. It makes great flooring, countertops cabinets, fences, and furniture. And since it’s a quickly-growing reed, it’s super sustainable and naturally pest-resistant. + Recycled & Re-purposed – Recycled glass and recycled stone counter tops are beautiful, durable, easy to clean, and much friendlier to the planet than new quarried stone slabs. + Reuse – Check out thrift stores for decor, before you hit the retail stores. + Use Public Transportation – Try Amtrak, the Coaster, the Trolley, bus lines, bike, or walking. Try splitting a cab or ride sharing too. + Carpool – You’ll use less gas and you can share the costs with your fellow riders. + Shop Local – Buy locally-grown foods at one of the many farmer’s markets in the county. There’s less transportation involved in getting the foods to you, thus reducing the carbon footprint of what you buy. + Water Off – When you wash your hands, lather up with the water off. Keep it off while brushing your teeth, too. + Go – Put a water-filled container in your toilet tank for less water useage per flush. + Green Thumb: Make your yard and garden water-wise. The City of San Diego has water conservation tips on its website. + Switch to LED lightbulbs – They use far less electricity than traditional incandescent bulbs, and less that compact fluorescents, too. Plus they don’t contain mercury like compact fluorescent bulbs, and put out very little heat. + Lights Out – For an easy way to power down, plug devices into power strips around you home. Just flip the switch to turn off everything at once. + Save with OhmConnect – Sign up at www.ohmconnect.com for free and join the Sierra Club team. You’ll save money and earn points while helping to keep the dirtiest power plants offline during peak hours. + Compost – Start a compost bin to keep food waste out of the dump, where it rots and releases methane, a major greenhouse gas. The City of San Diego holds free composting classes–just check their website, sandiego.gov. + Diaper Dilemma – Switch to cloth instead of using disposables, which sit around in landfills for 250 – 500 years. Rubber help with waterproofing. If you’re traveling, try biodegradable bamboo diapers. + Reuse & Recycle Foil – Don’t buy into the marketing of using foil to avoid doing dishes. Aluminum can be recycled using just 5% of the energy it takes to make a new product. If you must buy foil, go with 100% recycled product. + Packaging – Consider the packaging of products you buy and how you’ll recycle it. + Go Organic – Pesticides are harmful for humans, animals, and pollinating insects, like bees. One of the most widely-used pesticides, Roundup, contains a key ingredient called glyphosate. It’s a probable human carcinogen that’s present in high amounts in some very popular foods—like a cereal brand often fed to toddlers, brand name chips, cookies, and more. Glyphosate also binds to nutrients, pulling them out of the soil and out of food, decreasing nutritional value. Because it’s water soluble, glyphosate in crop runoff pollutes soil and water sources beyond the area that’s sprayed. + Just Say ‘No’ to GMO – Many GMO plants are resistant to pesticides, so multiple rounds of pesticide are sprayed on them to repel insects. Because of the wind and pollinators, like bees, some of the DNA can travel to organic farms and contaminate the crops. To create GMOs, biotech companies alter DNA structure, adding in what nature never intended. This alteration also allows them to patent the plant, and thus own it. We human guinea pigs don’t yet know the full extent of GMOs on our health. Something else to consider–biotech and chemical companies are in control of more of our food supply than our farmers. + Real Food, Not Processed – The more you buy plants and grains that are in their whole form, the more nutrition they’ll have and the more money you’ll save. You’ll have less packaging waste, too. + Support Sustainable & Fair Companies – You vote with your dollars every time you buy products. Support food and beverage companies with sustainable farming practices—not those who destroy the rain forests and the soil, spray toxins onto our crops, or pollute our rivers, land, and air. Choose companies that are fair to people and humane to animals. 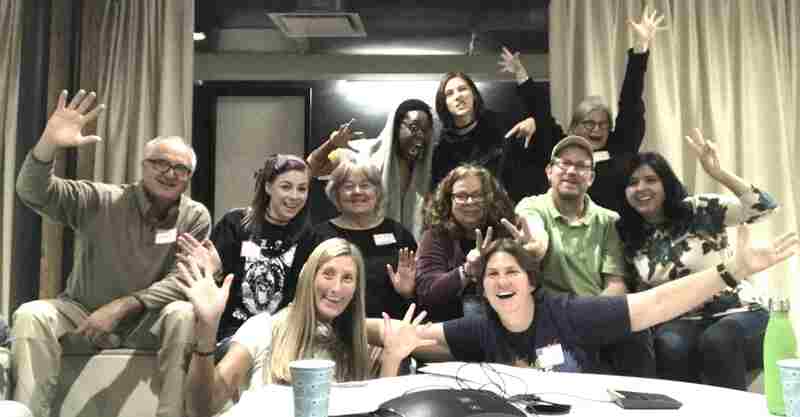 Michelle became involved in the San Diego chapter of the Sierra Club this past January 2017. She’s a member of the Conservation Committee, working on Zero Waste and Environmental Justice issues, and the new Conservation Chair for the Social Sierrans. 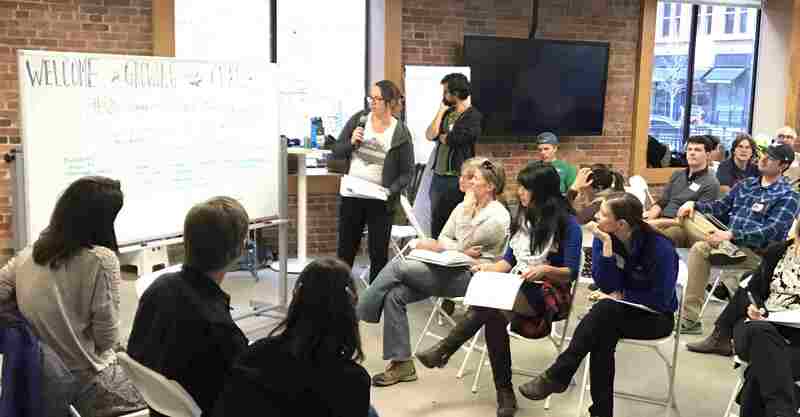 All across America, the Sierra Club is hosting workshops for staff and volunteers to transform the organization to one that is more equitable, just and inclusive. 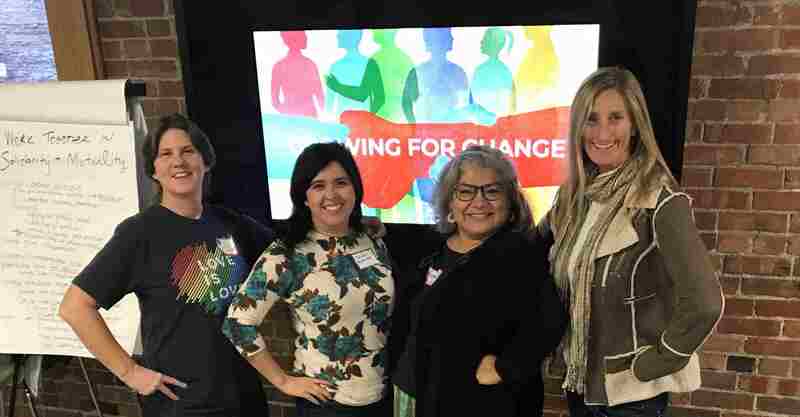 Recently 4 volunteers, Mayela Manasjan (North County Coastal Group), Kelly Conrad (North County Group), Bobbi Jo Chavarria (San Gorgonio Chapter) and Stefanie Maio (San Diego Chapter) attended the Growing for Change Workshop in Denver, Colorado. At the workshop the representatives from Southern California had the opportunity to meet people from across the country who were interested in learning how they could be part of the club’s transformation. Over the two days, participants learned more about the history of the Sierra Club including the founding of the club by a group of privileged individuals and how the club is looking to incorporate the Jemez Principles in this journey of transformation. The Jemez Principles have been endorsed by the Sierra Club Board of Directors as a set of guidelines designed to help people from different struggles and communities work together in solidarity. Each of attendees are sharing what they learned at the Growing for Change workshop with their respective Executive Committees or Steering Committees to encourage everyone to incorporate the Jemez Principles in transforming the Club. How can you make a difference? Learn more about the Jemez Principles and try to incorporate them in your daily lives.